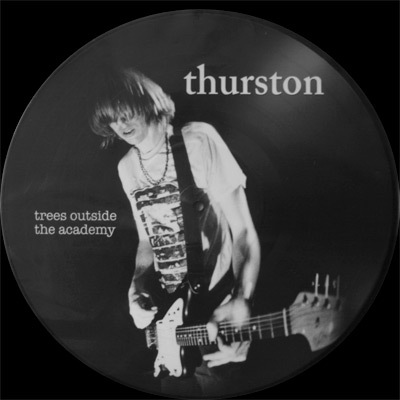 This week on Talking 80s Music we decided to focus on Sonic Youth's guitarist/singer/songwriter Thurston Moore. We skirted the band's history (as they are something to consider for another episode) and focused on Moore's solo work and featured "Frozen Gtr" and "Fri/End" from his 2007 album, Trees Outside The Academy. Martin has now added it to his shopping list after listening to the tracks a few times. We've mentioned here before about our not taking callers for awhile due to technical issues. Well, we tried to make up for it by getting in conversations with some of our chat room regulars as well as a friend of Martin's that was one of the first subscribers to the 80s Nuts Newsletter over a decade ago. A great surprise and we were able to make it work (with a lot of post-editing.) Might attempt to do that again at the end of every month or so. Maybe. from "Trees Outside the Academy"